The tulips and other spring bulbs in the garden are just coming to an end as we approach mid-May. The warm weather has finally arrived and there are so many flower buds forming in the garden. Biennials such as Honesty, Sweet Williams and Sweet Rocket all come into their own this month. 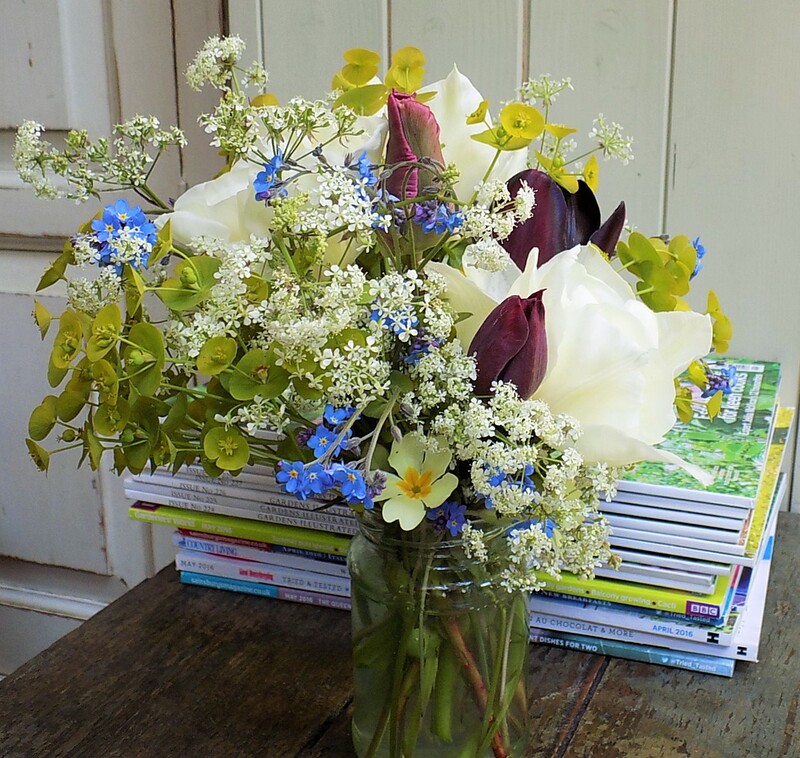 They are invaluable flowers to have in the garden in order to plug the gap between the end of the spring bulbs and the beginning of flowering of hardy annuals. Hardy annuals sown in the spring will start to flower towards the end of this month or early in June, depending upon when you sowed them (and your geographical location). Many garden perennials also start to flower this month. I have Red Campion which is a great wild flower. 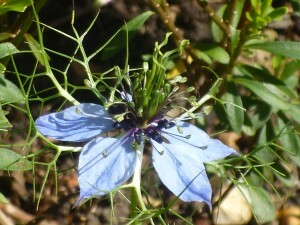 It will happily flower in the shade and produces flowers throughout the summer. 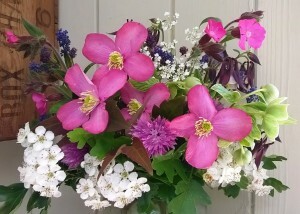 Aquilegias provide welcome flowers now and will self-seed throughout the garden. My mixed hedge is a good source of flowers. The tiny white flowers of Hawthorn are known as the May flower and look lovely in the vase. Viburnum oplus has white flowers that look a bit like lace-cap hydrangeas and Viburnum lantana has flat clusters of tiny white flowers. Cut them all just as the buds are opening to last as long as possible and split the stems of these woody plants to help with water uptake. The first Alliums are just breaking out of their buds and will flower throughout May and June. I love the large fire-work flowers of Allium christophii planted along with the smaller intense purple A. purpureum and white A. nigrum. The seed heads can be dried for fantastic displays later in the year. Oxeye daisies can be a bit rampant but seedlings are easily pulled out from the soil if they stray too far. These beautiful daisies make lovely meadow-style arrangements at this time of year and if you cut them down after flowering, they will produce a second flush of flowers in the autumn. The perennial wallflower Erysimum 'Bowles' Mauve' is a must for any cutting garden as it flowers practically year-round and is the best food source for bees. In the shady part of the border, I have some Tellima grandiflora which has thin spires of tiny green, fringed flowers, hence its common name of 'Fringe cups'. 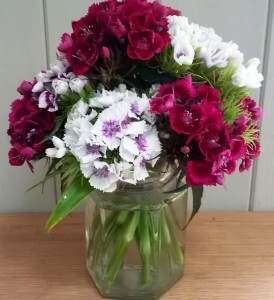 The flowers add some height to a flower arrangement while the fresh green leaves can be cut and used to soften the neck of a vase. 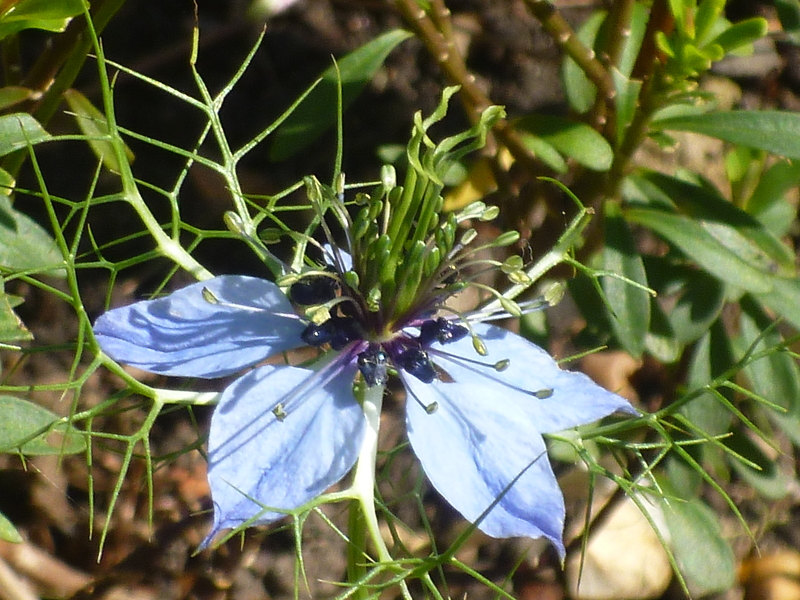 Nigella (Love-in-a-mist) is another flower that I wouldn't be without and, like many biennials, it self-sows really well. Leave lots to go up to seed and you won't ever have to buy any more seed! It has fabulous looking seed pods that can be collected and used both fresh and dried in displays. The final buds ripening in my garden are those of my climbing Rose 'Open Arms' which I cut throughout the summer and autumn. I find that it doesn't suffer from the dreaded black spot common in some roses. This year we have planted more climbing roses to scramble through the hedges on either side of the garden. Climbing roses are wonderful for repeat flowering all through the summer. 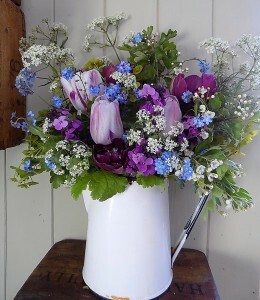 May has also seen the very first pupil through the door for my 'Grow your own flowers' workshop. It was a lovely day and we had fun arranging tulips with foraged Cow Parsley and cuttings from the garden - Forget-me-nots, Euphorbia, Tellima foliage, Erysimum, Hawthorn and Primroses. It's not too late to take a workshop and get started on growing your own this summer!